Founded by Catherine the Great, the maritime city of Sevastopol has been fought over for centuries. Crucial battles of the Crimean War were fought on the hills surrounding the city, and the memory of this stalwart defence inspired those who battled the Germans during the Second World War. Twice the city has faced complete obliteration yet twice it has risen, phoenix-like, from the ashes. 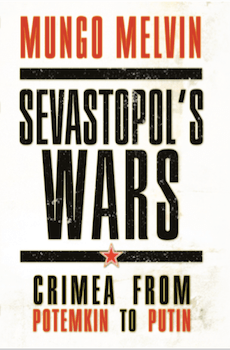 In this groundbreaking volume, award-winning author Mungo Melvin explores how Sevastopol became a crucible of conflict in three major conflicts – the Crimean War, the Russian Civil War and the Second World War – witnessing the death and destruction of countless armies yet creating the indomitable ‘spirit of Sevastopol’. By weaving together first-hand interviews, detailed operational reports and battle analysis, Mungo Melvin has created a rich tapestry of history. I cannot wait to get my hands on a copy of Mungo Melvin’s “Sevastopol’s Wars”. I have known him now for years and find his sharp academic mind matched by his military approach to history utterly inspiring. Spending a day with him in Berlin reviewing the Battle for Berlin in 1945 recently was an honour. Thank you Nigel for your kind words. As ever, I greatly enjoyed and appreciated your expert description of the final days of the battle for Berlin.